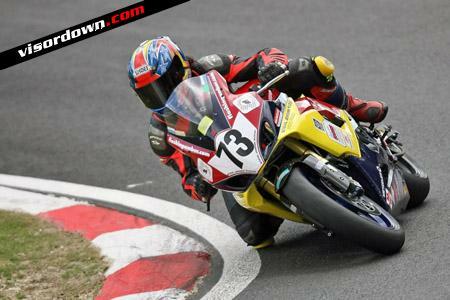 CADWELL Park was the setting for the 8th round of the UK Thunderbikes series run by the British Motorcycle Racing Club. Riding a tuned Suzuki SV650 Sarah Jordan came into this Cadwell meeting with a 19 point deficit to make up on closest rival Paul Barlow for 3rd spot in the championship. Winner here at the previous Cadwell Park meeting in April Sarah was confident of some strong results at the twisty and technical circuit. Sadly during Friday testing Paul Barlow encountered machine problems forcing him to get his spare bike delivered to the circuit Friday evening. With all objectives during testing met by Sarah all that was now required was to stay upright, consistent and take as much of the advantage as possible. Race 1 on Saturday gridded 4th Sarah got an uncharacteristic bad start missing two gears off the line. Now in 6th place Sarah had some hard work to make up the places. Passing Paul Barlow at Mansfield on lap two was quickly followed by a close pass on the Laverda mounted Phil Read at the chicane. Determination and confidence in the motorcycle meant Sarah was able to quickly latch onto the back of the leaders. Sadly not enough laps meant settling for 3rd place but this was enough to gain strong points and be in the fight. Race 2 Saturday and Race 1 Sunday were similar affairs. Again not perfect starts hampered Sarah in the first corner allowing Phil Read to get ahead in 3rd spot with Garry Budgen and Martin Cooper taking the first two slots. Lap two on Sundays 1st race saw Garry Budgen go down moving Sarah into 3rd place but due to light drizzle a slight hesitation after Garry's crash Ian Mayhew made a move past Sarah into 3rd position. Some battling then took place between Ian and Sarah trying to overcome the corner exit speed of Phil Reads Laverda. As the SV relies on fast corner entry speed it was hard to get past. Good fun racing though and as we have found this season the series attracts some strong but safe riding. So two fourth places for Sarah. Last race Sunday and with a very determined head on Sarah was eager not to let Phil get ahead into the first turn. A superb start, head down into turn one Sarah defended a move round the outside and set about trying to chase down race leader Martin Cooper. With a steady pace of 1.40 laps and a consistent gap of around 3 seconds to the leader Sarah bought the Suzuki home in 2nd place with championship winner from last season Rob Wittey on a borrowed bike in 3rd place. So it was enough and mission achieved. 33 points more scored than Paul Barlow and Sarah moved into 3rd position in the championship table. We now have Snetterton and Brands Hatch left to battle this one out. Also with 1st and 2nd places and 5th and 6th places being closely chased after it will more than likely bring about some very close racing. Onwards and upwards from here!